GUANGZHOU: Three people have been confirmed to have died from the mudflows and strong winds of Typhoon Neoguri in Guangdong province, while rescue workers are still searching for 40 fishermen, including 22 Vietnamese. The provincial flood-control headquarters said on Sunday that Neoguri killed two people in Shenzhen - a woman older than 80 and an 11-year-old girl - when a mudflow inundated a road under construction. One person in Zhuhai was struck and killed by an aluminum sheet that strong gales blew off a stadium roof. Neoguri hit south China with heavy rains and strong winds starting from Friday. It first landed in Wenchang city in the island province of Hainan at 10:30 pm on Friday. More than 1.3 million people in Hainan were affected; more than 213,000 of them were evacuated; and more than 550 houses collapsed. Provincial authorities estimated direct economic losses at 337 million yuan ($48 million) by 11 am on Saturday. Neoguri weakened to become a tropical storm after landing again in Yangjiang city, Guangdong at 2:30 pm on Saturday. The Guangdong headquarters received reports of damage in the cities of Yangjiang, Jiangmen, Zhuhai and Shenzhen. 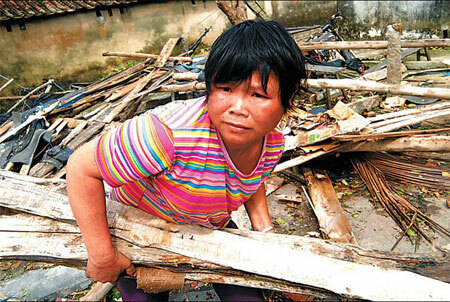 In Yangjiang, 274,000 people were affected and 7,000 hectares of farmland were inundated. Losses from the suspension of industrial production, and damage to embankments and telecommunications facilities were estimated at 96 million yuan. According to the provincial observatory, the storm dissipated at 5 am yesterday in Shanwei. The Ministry of Communications' rescue teams saved more than 100 fishermen on Saturday and sent helicopters to rescue another 40 yesterday. The Vietnamese embassy in Beijing requested China provide emergency assistance to 22 onboard a fishing ship. The ministry's rescue ship found the capsized vessel yesterday morning and dispatched a rescue helicopter to search for survivors. Neoguri arrived in China earlier in the year than any typhoon since 1949. The first typhoon of a year usually comes around June 29, a date determined by averaging the meteorological records of many years. The China Meteorological Administration had predicted more typhoons would hit China this year. The National Meteorological Center's chief forecaster Qiao Lin said Neoguri's early appearance was caused by the La Nina effect, which cools the Pacific Ocean's surface waters near South America, causing increased rainfall in southern China. The effect also caused the snowstorms that hit southern China in January and February, killing 107 people and causing 11 billion yuan in economic losses.